Leftover hot cross buns are screaming out to be turned into bread and butter pud. Give yours the edge by creating individual portions, then dousing liberally with this rather decadent sauce. 1. Preheat the oven to 180˚C, gas mark 4. For the caramel sauce, put the sugar in a large saucepan and warm until dissolved, swirling the pan occasionally. Turn up the heat and simmer for 2-3 minutes, until deep golden. Take off the heat and stir in the butter. Mix the brandy into the cream, then stir into the caramel until combined. Add a good pinch of sea salt and set aside. 2. Heat the milk, cream and vanilla in a pan to just below boiling point. Gently whisk the egg yolks and sugar in a bowl. Slowly pour the hot vanilla cream mixture over the egg mixture, whisking constantly. 3. 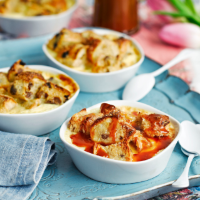 Take 6 x 200ml ramekins and put 1 tbsp of the caramel into the base of each. Pile the chopped hot cross buns on top, then ladle over the custard. Top each with a sprinkle of demerara sugar and bake for 20 minutes, until golden. Serve with any remaining sauce drizzled over the top, if liked.